BIG MOVIE FREAK: Robotech: The Live-action Movie! I'm beginning to suspect that I have a sixth sense. 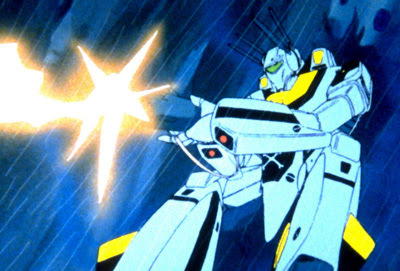 In my review of Transformers, I predicted that the movie studios would start adapting other robot-related anime such as Robotech, and lo and behold it has come true! Ok, maybe I was stating the obvious, since Robotech is really one of the most highly regarded classic anime around. What's even nicer is Tobey Maguire's involvement in this adaptation, which will guarantee some class in the acting department. Anyway, it's time we see some more fricking robots kicking the crap out of each other... in space! I'm pretty bored already with them superheroes and pirates and medieval crap. Check out the original article here to find out which other robot anime* also got greenlighted! *Highlight for answer >> It's Voltron! this is simply awesome...and it's gonna be a trilogy, if tobby does not screw up...hey, if he's playing rick hunter...i wonder who's playing lin min mei? Well, you know Hollywood. These are the only female Asian actors they will consider: Zhang Ziyi, Ming-na, Sandra Oh, Gong Li, Michelle Yeoh, Kelly Hu, Maggie Q and Eddie Murphy.